There is a lot to complain about regarding the FDA’s tobacco regulation unit. The really important bits involve complicated legal and scientific questions, and in a few places even some room for legitimate debate (though you might not be able to dig through the muck to find it). Someone might even say that in many cases they are doing what they have been assigned to do, and could even be doing about as well as can be expected, given the conflicting legal constraints and the plethora of bad advice they are getting. The same cannot be said for their communications to the general public, which are both inappropriate (not in keeping with the legitimate mission of the FDA) and so embarrassing and amateurish that it makes the entire operation look worse than it really is. I have previously pointed out: (a) FDA has no business trying to do consumer manipulation “education” since, even to the extent that someone might argue that such Big Brother-ism is a legitimate mission of CDC, it is clearly not a legitimate mission for FDA. (b) This is especially true given how bad at it they are; their material reads like it is coming from some third-rate county health department or non-scientific activist group — indeed, that it pretty clearly where they are copying some of it from. (c) The @FDATobacco twitter feed is especially pathetic, with a large portion of its traffic consisting of thanking people by name for following and retweeting, and much of the rest being material that could have come from the aforementioned third-rate departments or non-scientific charities, rather than a scientific arm of our national government. It is truly a national embarrassment. 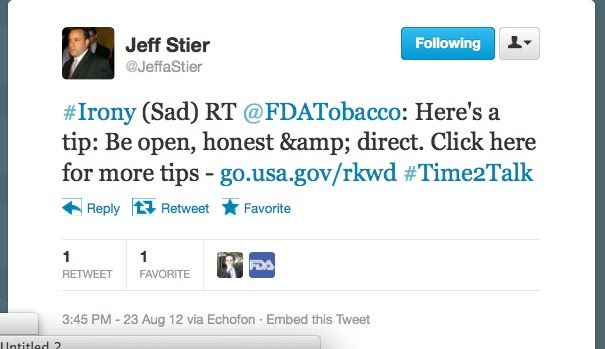 I was reminded of this when @FDATobacco “favorited” a tweet from Jeff Stier (s/o to Jeff for alerting me to this), in which he ridiculed them for offering advice on how to talk to your teen that recommended being honest and open — two things that FDA Tobacco is very much not known for. Apparently they did not recognize that it was sarcasm, which is about par for their general savvy. True or False: Tobacco use is the leading cause of preventable death in the United States. The details of this are probably a little complicated for the kids, but this statement is, and has always been and is well documented as being, nonsense. I am not just talking about the built-in implicit lying about low-risk products by referring to “smoking” as “tobacco”, though that is probably the most harmful aspect of it. The problem is that if it is “preventable”, why are we not preventing it? Because we actually do not know how to do so, of course. Then why is it “preventable”? Because they are quite sure it can be prevented just as soon as they figure out how to do it. But by that definition, cancer or apoptosis is a preventable cause of death too. Of course, this nonsense statement is a convoluted way of trying to avoid making the true statement, “of all the things that people choose to do, smoking is the one that kills the most”. But then they would have to admit that people are choosing to do it, and admitting that would be very hard on their self-identity and job security. True or False: In order to purchase tobacco products in the United States, an individual must be at least 16 years of age. When I answered True, it told me I was wrong and that individuals must be at least 18 years of age. Which, of course, means that they also must be at least 16 years of age, so the correct answer is indeed True. False would mean that you could buy at younger than 16. Numeracy is not the strong point of these people. True or False: Youth are sensitive to nicotine and can feel dependent sooner than adults. The first bit of that conjunction is rather odd to even ask (does anyone really think that young people are immune to nicotine?) so the truth value hinges on the latter part. They assert “the younger they are when they begin using tobacco, the more likely they are to become addicted to nicotine and the more heavily addicted they will become.” Since there is no scientific definition of “addicted”, let alone “more heavily addicted” this is a little hard to judge. It turns out there is remarkably little solid evidence on this topic (once you replace the dramatic words with something scientific), given the huge confounding problem. True or False: Smokeless tobacco is addictive and can lead to dependence. Wow, wasn’t that sneaky of them? They ask a question that while somewhat fuzzy and misleading (trying to demonize smokeless tobacco without actually declaring it to be harmful), but that is not completely outlandish. And then they provide an answer that is all lie. 28? A better estimate would be 1000, which is also a good estimate for any plant or animal matter we eat (though I suppose in the spirit of “at least 16”, above, I gotta give that one to them). Of course, when you say something “contains cancer-causing agents” you are communicating that it causes cancer to some measurable degree, which is a lie according to the evidence about the smokeless products that the target audience is likely to be using. As for “more likely to become smokers”, this is either false (if you interpret it to mean “more likely than they would have been had they never used smokeless”, which is how most readers will interpret it) or a lie via literal truth (if you interpret it to mean “almost everyone who chooses to use smokeless tobacco is someone who is also more inclined than average to smoke, and thus more likely than average to become a smoker”). True or False: Tobacco smoke contains about 70 chemicals that can cause cancer. If they had said “at least 70”, then in the spirit of “at least 16” they would have been literally correct. Of course, since so many chemicals can cause cancer in the right dosage and location, and you can never conclude that a particular chemical never causes cancer, this is pretty unscientific phrasing from people that are supposed to be a scientific organization. But that is not the worst of it. The answer (True, of course) goes on to say “Therefore, it’s no surprise, then, that smoking causes about one in three of all cancer deaths in the United States.” Huh??? Even setting aside the accuracy of the statistic, how they hell do they translate “contains 70” to “causes 1/3”? It is bad enough that they are so scientifically illiterate that they think that makes sense. But should they really trying to keep American youth ranked so low in math and science literacy? True or False: Youth who are exposed to images of smoking in movies are more likely to smoke. Anyone feeling good about the fact that we are being looked over by the beneficent and honest scientific experts at FDA?